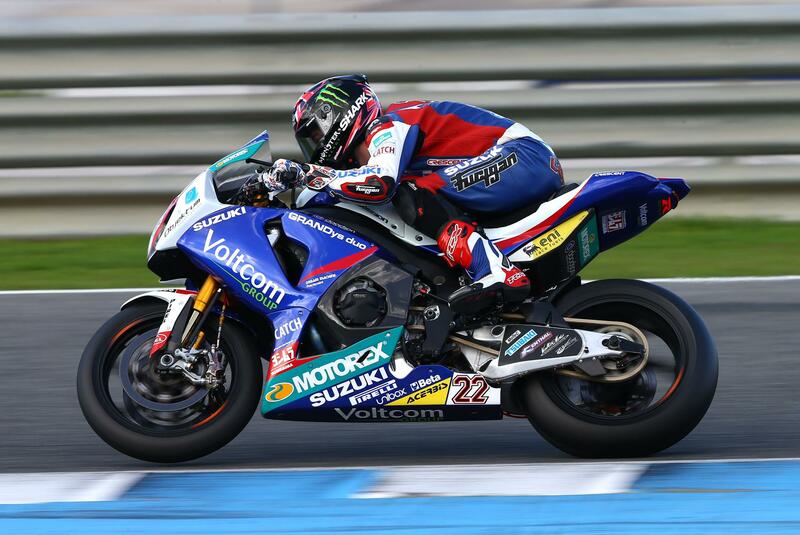 Alex Lowes (Voltcom Crescent Suzuki) put in a strong lap on qualifying tyres to go fastest of all the regular WSB riders on the second day of Jerez private testing, his 1’40.730 being set late in the day. After another morning spent waiting for the track to dry WSB regulars, plus two Suzuki and two Aprilia MotoGP bikes, took to the track at Jerez and were finally treated to a dry track and warm temperatures. Kenan Sofuoglu was also out on his World Supersport Puccetti Racing Kawasaki. Tom Sykes (KRT) used a Q to set the second best Superbike time, but had contact with another rider on one of his fastest laps. Leon Haslam (Red Devils Aprilia) completed a British clean sweep of the phoney podium positions after leading day one. He was also reported to have used a Q tyre near the end. MotoGP Aprilia rider Alvaro Bautista was fourth in his Aprilia, his team-mate Marco Melandri eighth as he gets used to Bridgestone tyres after his switch from WSB to MotoGP. Both went slower than the Suzuki MotoGP riders, according to Suzuki’s stopwatches. Jonathan Rea continues his learning curve in an upward direction for KRT with fifth best time, one place ahead of Michel Fabrizio, Haslam’s team-mate for these tests. New world champion Sylvain Guintoli had his first real dry weather outing on his new Pata Honda and took his CBR to within less than a second of the fastest Superbike times. Suzuki was on site with its pair of MotoGP machines for Maverick Vinales and Alex Espargaro, but there were two mechanical failures on the GSX-RRs during the day, with smoke emanated from the new MotoGP entries. Barni Racing Ducati rider Leandro Mercado had a crash that broke his left wrist, sending him back to Modena in Italy to have it examined and operated on, as he also suffered a suspected dislocation of the wrist joint.